This is being done on a voluntary basis by drug manufacturers in both Canada and the United States. This change will occur in tandem with label changes to reflect the new prescription status of products sold in Canada (see Veterinarian FAASTsheet #7). The vast majority of these products also have preventative or treatment claims, and therefore will still be available on the market. Ionophore and coccidiostat products will not be affected, as they are not considered MIAs (see Veterinarian FAASTsheet #3). Antimicrobial resistance is a global concern affecting human and animal health. To combat antimicrobial resistance (AMR), measures must be put in place to reduce unnecessary use of antimicrobials and improve overall antimicrobial stewardship. There has long been controversy surrounding the use of antimicrobials as growth promotants in food animals. 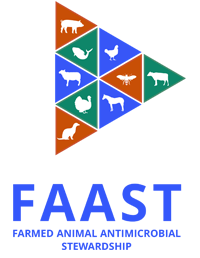 In the past, antimicrobials have been used at a subtherapeutic level to promote growth and feed efficiency in livestock. This strategy has the potential to exert selection pressure on bacteria leading to an increase in antimicrobial resistance. Eliminating the use of MIAs as growth promotants may help slow the emergence of AMR, and will help Canada to align with international recommendations to help combat AMR. This change should not have a significant impact on practitioners in Ontario. Animal owners may ask questions about the rationale or reasoning behind this change. There could also be an increase in pressure on veterinarians to prescribe antimicrobials for preventative purposes, because animal owners will no longer be able to access and use these products without a prescription. This may alter management practices for some animal owners who have previously obtained antimicrobial products from their commercial feed mill, livestock medicine outlets, or cooperative without a prescription for use as growth promotants. Animal owners will need a prescription to obtain MIAs (either in feed or other products) and cannot use antimicrobials for growth promotion. A few MIA products that only had growth promotion claims will no longer be available for sale, which could lead to questions from clients regarding availability.